There are currently two models of Porter Cable table saw available, the portable PCB220TS jobsite saw and the PCB270TS stationary saw. Porter-Cable has been considered a professional-grade tool manufacturer for a number of years, and they still make lots of great tools. However, in recent years they have also started offering some lower priced tools and equipment. Their tablesaws fall into this category. With woodworking tools, you usually get what you pay for. The lower priced power tools can't really compete with equipment that is twice the price, although many people fail to realize this. Both versions of Porter Cable table saws are value-priced, and kind of stand in between the cheap imports and the true professional-grade tools. A portable table saw is always a compromise. In general, the larger and heavier a tablesaw is, the better. But not when you have to tote it around with you! The PCB220TS Porter Cable table saw balances these conflicting needs better than many other offerings. Like most portable table saws, it has an aluminum table for light weight. It is popular with pros that have to transport their tools from jobsite to jobsite. With the right side extension it has a rip capacity of 24-1/2", which is more than many portable models. The PCB220TS also has an extendable outfeed support that many other brands don't offer. It has a 15 amp motor and will cut lumber up to 3" thick at 90 degrees. This jobsite saw also has built-in tool storage for the fence, guard assembly, push stick and miter gauge. Unlike some of the cheaper models on the market, the Porter Cable table saw uses the standard 3/4" T-slot miter gauge groove so you can use aftermarket miter gauges, sleds, and jigs. It comes with a folding stand with two wheels so it can be moved around easily. Most owners seem to be quite content with the portable PCB220TS. It receives 4.1 out of 5 stars on the Lowe's website, with over 100 total reviews at the moment. Owners like the portability and many comment that it is great for a jobsite table saw. Over and over again, owners comment that it is a great value, and possibly the best-quality table saw in its price range. However, there are a few common complaints. The throat plate is rather thin and flimsy, and its design makes it difficult to make a zero-clearance insert for it. There also is a glide on the underside of the fence that reportedly isn't glued on very well. There are some complaints about the stability of the fence and the amount of plastic used, but that is what you get in this price range. It seems to be a very well-made tool for the money, and it comes with a 3 year warranty. The only other good-quality competitors it has that are close to its price range are the Ridgid R45161 and the slightly more expensive Dewalt DW745 and Bosch GTS1031 table saws. None of those come with a stand (although the Ridgid has wheels and a retractable handle), and the Dewalt and Bosch have considerably smaller rip capacities (16" and 18"). If you are looking for a portable table saw in the $300 or so range (at the time of this writing) including the stand, there really isn't much else out there that compares to the Porter-Cable PCB220TS. 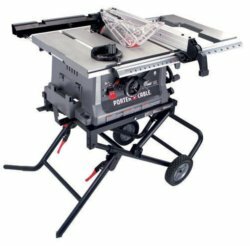 The stationary PCB270TS Porter Cable table saw fits into the "contractor saw" category. It has a cast iron work surface with steel extension wings. This saw has a 30" rip capacity, which is more than some other models in its class. It has a dual voltage motor: 15 amps with 120 volt household current or 7.5 amps with 220 volts. The blade is belt driven, with a maximum 3.5" cut depth. One feature the Porter Cable contractor saw offers that many other "stationary" models don't have is built-in casters. The casters are inside the legs so they don't get in your way, and they can be raised or lowered with one foot. This makes it easy to move it out of the way when you are not using it. Owners on the Lowe's website give the Porter Cable PCB270TS 4.4 out of 5 stars with over 50 reviews at the moment. Again, owners commented over and over what a great value this saw is for the price. People really like the built-in caster system, and many made comments about how smooth and vibration free the saw is. The PCB270TS has very few complaints. Like the portable model, the throat plate is a little flimsy. The fence is not as good as it is on more expensive tools. But like the portable model, this is kind of the entry level "good" table saw. It offers the same (or more) capability as many of the more expensive brands, but doesn't quite measure up to the more expensive ones in the accuracy department. It also comes with a 3 year warranty. The closest competitor to the Porter Cable PCB270TS would have to be the Ridgid R4512. The Ridgid has a similar 30" rip capacity and built-in caster system. It also gets great reviews, and at the time of this writing costs about $100 less than the Porter-Cable contractor saw, so it is definitely worth a look. If you have a little more money to spend, Grizzly has both a contractor saw and a hybrid table saw that get good reviews. Both versions of the Porter Cable table saw offer a great value for the money. No, they aren't going to provide the precision of more expensive models, but not everybody needs (or is willing to pay for) the extra measure of refinement. You can get all the detailed specs on both Porter Cable table saw models at Porter-Cable.com. Sidenote: If you are buying your first table saw, or need help tuning up one you already have, I would recommend getting a good book on the subject. The two books that seem to be recommended most often on the woodworking forums are Jim Tolpin's Table Saw Magic and Kelly Mehler's The Table Saw Book . Both of these books have good ratings on Amazon, and they cover all the basic operations, as well as safety, maintenance, and table saw accessories. 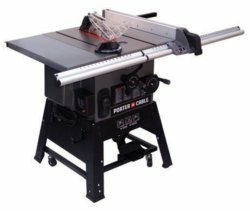 If you are looking for the cheapest tablesaw you can get, the Porter Cable models don't fit the bill (take a look at the Skil table saws instead). If you are a professional cabinetmaker working on million-dollar homes, go spend twice the money to get a more precise and accurate portable tablesaw like the Bosch 4100-09 or a cabinet saw like a Powermatic, a Delta, or a Grizzly. For most of the rest of us, a Porter Cable table saw will suit our needs just fine.